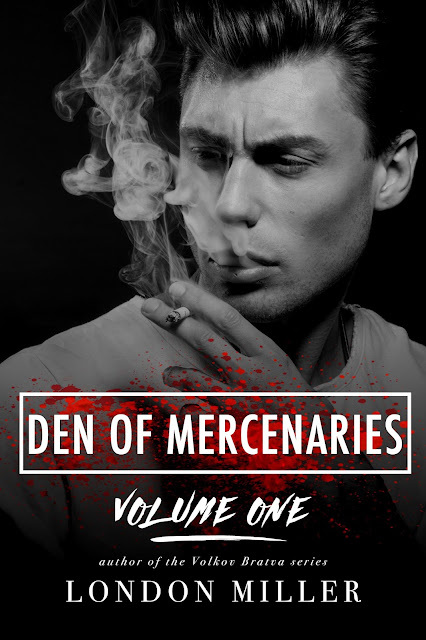 featuring each couple, as well as the first look into how the Den came to be. Welcome to The Den!! A trained group of deadly Mercenaries!! Life as Niklaus knew it was ripped from him in one horrific tragic incident. Being taken, tortured and losing the love of your life takes a toll on a man!! Wanting retribution Niklaus is offered the gift of a lifetime. Yet this gift comes with strings attached. They will break his mind first, then his body and if all goes to plan he will turn into "a weapon." After three years of preparing Niklaus(now known as Red)is ready to take out the men who tortured him and his beloved. Vengeance is the only thing on his mind....until her!! She made him feel alive. She made him feel human. He would do anything to protect.....Raegan. Don't get me wrong here it took Niklaus time to get to the point of really wanting to be with Raegan. This was not a love a first sight thing. It was a hopeful let's work out some aggression here thing. In bed!! Niklaus was on a mission. Things needed to be done before he could move on with his life. He could only offer Raegan a night or two. No matter how often he "disappeared" he always went back to Regan. He was drawn to her. Now Raegan was a hard working woman that is moving on with her life. Not waiting for a man to appear at his convenience. She follows her dreams and tries to put the mysterious man behind her. Years have passed, past hurt and hope pushed to the back of her mind until one day he's there standing in front of her. All the pain and hurt rushes back full force. She wants to know why after all these years he's back. It's simple really...Niklaus is back for Raegan!! Of course things can't be that cut and dry. Not when it comes to the Den. Like I said before Niklaus will do everything in his power to protect Raegan. He lays everything on the line!! He explains to Raegan why he is the way he is. He's willing to fight for the woman he has slowly fallen in love with. Part One of Red your heart breaks for Niklaus. You feel his pain and anger. His need for vengeance. Part Two of Red you see his strength. You see him slowly show his human side. You get to watch him get his life back. The Epilogue warms your heart. It made me smile. Now the Intro to CODA well I don't know how to fully explain that. The Kingmaker has a plan and it's "game on" now. Celt is beautifully broken. Master thief and dangerous Den member. His painful childhood and mercenary training made him the man his is today. One train ride together has sealed their fate!! Asked to steal a priceless painting by none other than the Kingmaker, Celt and Amber's journey has begun. As an artist Amber sees the beauty in things. Celt is rough and tough on the outside, but when his Irish charm comes out it truly is a sight. Beautiful love story with a twist. It is all a game! The Kingmaker is a "fixer" for the right price though. His current plan is the "endgame." All playing are his pawns. "Freedom is a burden, but you learn to bear it." What an introduction to The world if Nix and Calavera. We meet these two briefly in Celt. Only London Miller's characters would be found sparring in a therapists office. There are two parts in this book. Luna(Calavera)is kidnapped as a young teenager. Held in captivity for years, suffered as no one should. Once rescued(by the Kingmaker of all people)she finally tastes freedom. 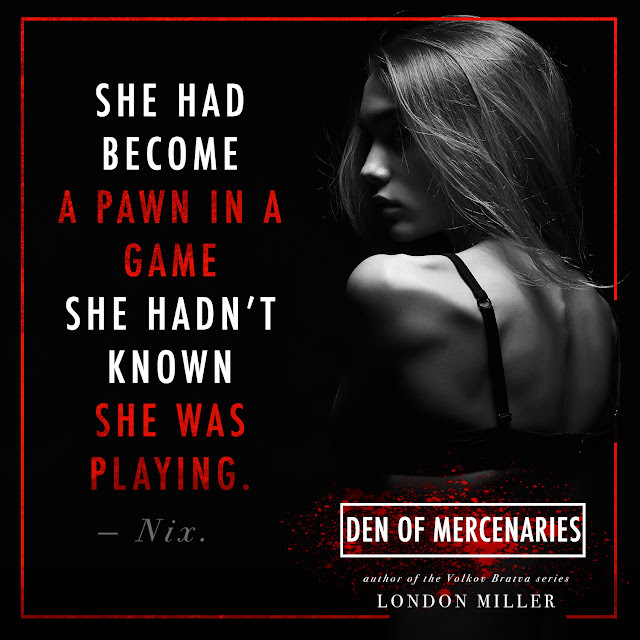 Brought to Kit(Nix) she begins her training as a mercenary. Feelings between these two evolve. The chemistry and passion is explosive!! This part brings us back to the beginning of this story. This part shows us how their love once was and how it is now. Kit is determined to "fix it." He will do anything and everything in his power to get his wife back!!! Many new players are introduced in this book. The game is getting bigger and more intense. We see more into the Kingmaker. Who is brave enough to against this man? "We all make our choices, but our choices have consequences." Calavera is the continuation of book 3 "Nix." This book brings to light as to the vision the Kingmaker has for Luna. Full of suspense, action, drama, sexiness and a whole bunch of ohhhhh sh*t moments!!! Kit takes us on a journey to what happened before Luna and himself work through everything. It shows us how Kit "fixes it." They fight for their love!!! They fight for each other!! All the players have shown up for this game. The Mercenaries and The Wild Bunch come together(somewhat)to try and get answers they so desperately want. More risks! More players! Bigger game! Who is really running the show? We get more insight into the Kingmaker. We see why he is the way he is. We also see that he might not be the one truly in control of the game!! !